VALENTINES DAY CUP MODEL SAILBOAT RACES, MIDDLE CAICOS, Turks & Caicos Islands. 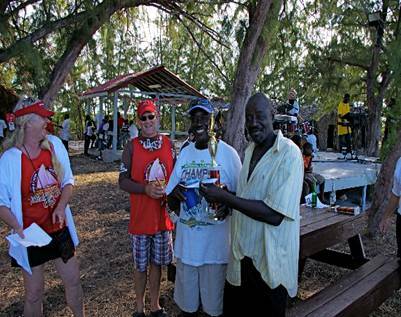 Bambarra beach, Middle Caicos in the Turks & Caicos Islands was the place to be this Saturday February 15th, 2014 for the fourteenth annual Valentines Day Cup Model Sailboat Races. Begun as a milennium project in 2000 to revive the traditional hand carved model sailboats – a beloved toy in bygone years – this wonderful event is now a major feature on the TCI calendar each year with over 50 model sailboats boats participating in four race classes. And new for 2014, the Premiers Cup race for the large (over 40” ) boats was officially initiated as the Hon. Dr. Rufus Ewing, Premier of the Turks & Caicos Islands, took to the water! Participation across the board was very keen with over a dozen captains in the water racing boats in each class, with an enthusiastic crowd on the beach cheering everyone round the course!! Caribbean Cruisin ferry to North Caicos – a big supporter of the Valentines`Day Cup !! The official committee members worked hard : Oneika Simons of the TCI Tourist Board, John Lawson of Caribbean Cruisin’/TCI Ferry, Mark Parrish of Big Blue Unlimited, David Bowen of the Culture Department, Sara Kaufman of the Middle Caicos Co-op and Middle Caicos Sailing Association founder Daniel O. Forbes of Daniel’s Café! Each of these businesses has been a solid major event sponsor for many years, steering the event and the day ever forward. Additional sponsorship was warmly welcomed from the Premiers Office, Liquors Plus in North Caicos, Forbes, Forbes & Forbes Ltd. realty brokerage, Ephraim Ltd. construction, and Fortis TCI. Generous personal donations were received from Sarah Kellett, Lindsey Menson & Matt Emory, and Dan Steele – with boat launch fees provided by the owners of The Banana, T&C Reservations, MSOS Victory, and Seawings. Nominal race entry fees paid and cash prizes donated back added to the fund raising! The day was perfect with a light breeze to send the boats around the course, great live music on tap with Full Force Rip Saw Band from Grand Turk, , local food tempting all and the bar happily tended by the national Turks & Caicos Islands Sailing Association members from the Provo Sailing Club. Master of Ceremonies David Bowen kept it all flowing, Commodore John Lawson organized each race while Race Referee Mark Parrish kept order around the course…and a grand day was celebrated on Bambarra beach! aaahhh, me and the boats on Middle Caicos!! 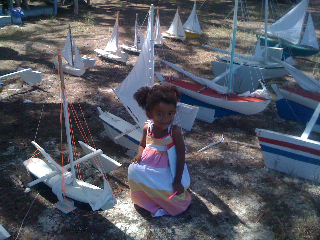 Proceeds from the Valentines Day Cup Model Sailboat Race event promote both sailing and local culture in several ways : 1) Turks & Caicos Island Sailing Association programs, 2) ”Sailboat House” on Middle Caicos with boats on exhibit, demonstrations and information about this traditional toy and 3) primary school program to introduce model sailboat racing to local North and Middle Caicos children. Donations, sponsorships and launch fees all help support this event – please get in touch to order your model sailboat boat or to participate in any way! This event is focused on the sparking shallow water, encouraging family fun as the model sailboat races run throughout the day with friendly competition among the captains. Awards include cash prizes, trophies and signature hats for all boat captains, with the new Premiers Cup a permanent display trophy inscribed each year with the winner name. Please email middlecaicos.tci@gmail.com with questions, to sign up as a volunteer or coach, to order your own model sailboat or to make donations. And plan to be there next year – Saturday February 14th, 2015!!! This entry was posted in News, Uncategorized on June 26, 2014 by Sara Kaufman.